Okay, folks, it’s time for one more — hopefully last — push on behalf of the Georgia Archives. Because we’re down to one last best chance to get the funding the Archives needs to continue — and perhaps even increase — access and hours as it moves to the control of the University System of Georgia from the control of the Georgia Secretary of State. The issue is now firmly in the hands of the Georgia State Senate, and that’s where efforts need to be focused today. The House of Representatives has already had its say on the bill transferring the Archives (it passed on March 5) and on the budget request for the Archives. Although it kicked a little more into the pot, it’s not as much as University System of Georgia Chancellor Hank Huckaby asked for. Right now, the budget as it passed the House will appropriate roughly $4.07 million for the Archives — more than the $3.85 million recommended by Governor Nathan Deal, but less than the roughly $4.3 million the Chancellor wants. So it’s over to the Senate side now for both issues. House Bill 287 — the bill transferring the Archives from the Secretary of State to the University System of Georgia — is now in front of the Senate Higher Education Committee, comprised of Senators Bill Cowsert, Chairman, Joshua McKoon, Burt Jones, Buddy Carter, Hardie Davis, Tim Golden, Lester G. Jackson, Nan Orrock, and Cecil Staton. This one is considered likely to pass — it passed the House by a vote of 170 to 0 — so if you’ve only got time to reach out once on one issue, read on. If you do have time to write a Senator about both, contact information for these folks can be found at the Georgia State Senate website. The budget bill is where the biggest push is needed. First off, we need to protect the gain achieved in the House. In the overall scheme of things, $224,000 isn’t all that much — but it’s a small step in the direction of better access and better hours. Second, we need to push — and hard! — for more. There were good reasons behind Chancellor Huckaby’s request for a total of $448,266 more than the Governor recommended and, frankly, good reasons for more than that. But to get anything more — and even to keep the $224,000 gain from the House — we can’t sit idly by and hope the Senate will do the right thing. Now is the time to speak up and be heard. 1. Read up so you’re sure you understand what’s at stake. 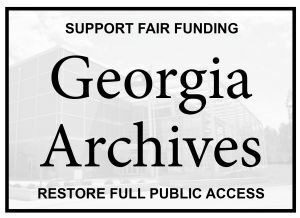 There’s good information on the websites for the Friends of the Georgia Archives and History (FOGAH) and updated information to help you stay on top of the issues at the GeorgiaArchivesMatters blog. 2. If you’re a Georgia resident, take a look through the list of members of the Senate Appropriations Committee and particularly its Higher Education Appropriations Subcommittee and see if any member represents your District. The simple fact of the matter is that legislators respond better to people who can directly vote for — or against — them. The subcommittee members are Senators Buddy Carter, Ronnie Chance, Bill Cowsert, Gail Davenport and Cecil Staton. Other committee members are Senators Jack Hill, Chairman, Renee Unterman, Tim Golden, Don Balfour, John Crosby, Vincent Fort, Steve Gooch, Bill Heath, Judson Hill, Bill Jackson, Butch Miller, Jeff Mullis, Jack Murphy, Valencia Seay, David Shafer, Freddie Powell Sims, Horacena Tate, Curt Thompson, Steve Thompson, Lindsey Tippins, Ross Tolleson, John Wilkinson and Tommie Williams. 3. If you’re not a Georgia resident, look through the list above and see if any member of the Appropriations Committee represents a district where your ancestors lived. It’s not as good as “I’m your constituent and I vote,” but being able to say “I’m a descendant of people from Bryan County and I visit and spend money there when I do genealogy research” isn’t bad as part of your argument, targeted to a specific Senator. Again, both contact information for these folks and even district maps can be found at the Georgia State Senate website. And there’s a list of Georgia counties with the corresponding Senate Districts and then the list of Senators at the state Senate website. 4. Write a letter. Make a call. Send a fax or an email. Speak up. What a great explanation. Thank you! Fingers and toes crossed, Barbara! As a descendant of lots of Georgia folks, I’d love to see the full amount budgeted! Thanks for all the details Judy! Hoping support will continue to grow! Sure do hope so, Heather. I have lots of lines out of Georgia I haven’t researched yet and I sure don’t want to lose any access I can get! And I’m just one person with those issues.